what poor pointed hands Pauline has! what about an engagement necklace? colin actually knew that word………….? i know its referring to gender but i just think its awkward…..
why is pauline telling colin this anyway? shouldnt she be telling the person she will find this? I’m sure she still wants one. Love till the end of time!! Well, now Colin knows. Wink wink, nudge nudge. You can’t put a price tag on Pauline! It would fall off. haha i have fun reading this.. hehhe..
but who is pauline ever gonna marry? I think Colin should marry Pauline and not us. Well isn’t Colin so smarticles! 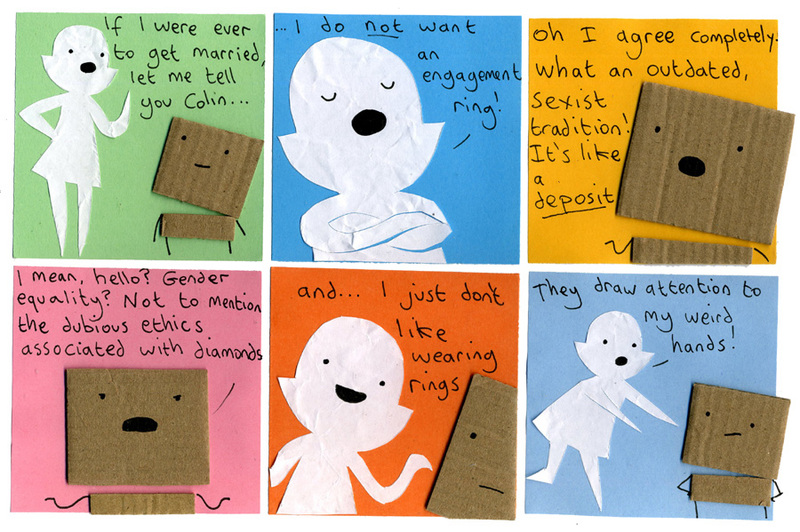 And I agree with Pauline, except I do want a ring even though I have short and square fingers! !